Better to Wait on Reform? A newspaper article published in The Oviedo Voice on January 2, 2003. 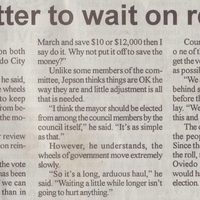 The article discusses reforming the city government of Oviedo, Florida. Some members of the Oviedo City Council had proposed reforms to allow the popular election of the Mayor of Oviedo, rather than election by council members. Original newspaper article: DeSormier, Vicki. "Is It Better to Wait on Reform?" The Oviedo Voice, Vol. XIII, No. 1, January 2, 2003: Private Collection of Sarah Thorncroft. Digital reproduction of original newspaper article: DeSormier, Vicki. "Is It Better to Wait on Reform?" The Oviedo Voice, Vol. XIII, No. 1, January 2, 2003. Originally created by Vicki DeSormier and published by The Oviedo Voice. DeSormier, Vicki. “Is It Better to Wait on Reform?.” RICHES of Central Florida accessed April 24, 2019, https://richesmi.cah.ucf.edu/omeka/items/show/6257.